The Helenium genus contains plants that are hardy perennial in nature. Most garden varieties range between 60 and 120 cm, and have daisy like flowers of red, orange or yellow. They come into bloom from the end of summer until the first frost. 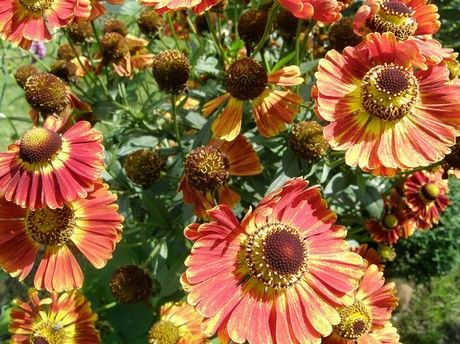 Some common names for members of Helenium include Yellow Star, Sneezeweed, and False Sunflower. Photographs: Helenium autumnale by Wallygrom and Helenium by Lillie2de. Common Names: Sneezeweed, False Sunflower, Rosilla, Yellow Star. Native: Northern and Central America. Flowers: Middle of summer through to the first frost. Flower Details: Gold, Orange, red. Daisy-like ray and disc/pin-cushion florets. Multiple flower heads. Foliage: Herbaceous. Lance-shaped. Oval shaped. Rosette. Sow Outside: Cover seed. Start of spring or the beginning of autumn. Spacing: Small 12 to 18 inches (30 to 45 cm); Large 24 to 48 inches (60 to 90 cm). Sow Inside: Germination time: one to two weeks. Temperature: 70°F (21°C). Two months in advance. Transplant outdoors before the last frost or at the beginning of autumn. Requirements and care: Full sunlight. Best results in with soil pH 5.5 to 7.0 and rich soils, will grow in most soil types. Delay flowering by pinching back in spring. Water during dry periods to maintain soil moisture. Provide support with twigs. Regular deadheading. In autumn cut back to ground level. Requires to be divided every three years to maintain vigour. Propagate: by dividing in the spring in cooler areas or the autumn in warmer areas. 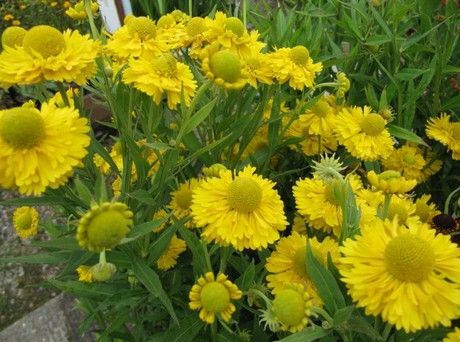 Sneezeweed, Yellow Star and other Helenium Plants can be grown outside from seed by sowing them at the start of autumn or the start of spring. Once the seed is sown give it a light covering of topsoil. They should be grown in a sunny area of the garden, ideally with a rich soil of PH 5.5 to 7. If you prefer you can start Helenium plants off indoors first by sowing them about 10 weeks before they are due to be transplanted into the garden; before the last frost of spring. They should take around one to two weeks to germinate at a temperature of 21 degrees Centigrade. Once ready the seedlings should be transplanted about 40 cm apart (small species of Helenium) or 75 cm apart (large species of Helenium). Once growing in the garden, yellow Star, Sneezewort and other Helenium members should be pinched back in the spring to delay flowering until the autumn. Following flowering deadhead the plants to encourage further growth. At the end of the flowering season cut the plants back to the ground. It is best to divide every four years to maintain healthy growth; division can also be used to create more plants in the spring.